Friends, all the feels are happening because Lily & Val turns 5 today!! Ahhh! It was 5 years ago today I pressed publish on an online chalkboard art shop. It was meant to be a hobby, but there were other plans in store. I am beyond humbled, grateful, and amazed at the past 5 years and the journey of Lily & Val. To celebrate, the Lily & Val team held a little party in our office! We were trying to come up with a really special way to share our birthday with you. It got us thinking about the impact writing letters and snail mail has had on shaping Lily & Val and our philosophies. Some of the most significant pieces of love and advice have been sent to us through cards that can be kept- what better way to celebrate our 5th birthday than to spread the joy of sending paper memory mementos? So, for a limited time, we are offering a surprise grab bag of 20 cards for $20 for our anniversary!! I don’t feel as though I have the words to adequately thank you for your support over the last 5 years. Nothing would have happened without you. Nothing. Because of your love and support of Lily & Val, my life has been changed forever. 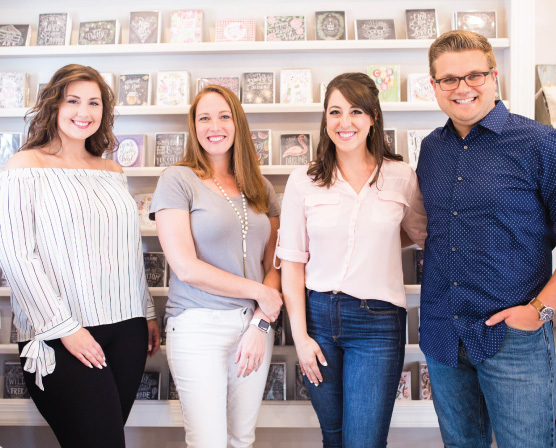 What started as a hobby has turned into a business with a passionate team of people behind it. Every purchase, every comment, every kind word – I don’t take any of it for granted. So, thank you from the bottom of my heart. Here’s to the next 5 years of Lily & Val! Grab your 20 cards for $20 grab bag here: PROMOTION HAS ENDED.